When I went to bed last night I had no clue on what direction I would take today. Last nights campground was a KOA and it was my most expensive. When I left Yosemite I was tired and hungry and didn't have a plan where I would stay. I have become accustomed to use nh an application called AllStays and I wanted to just find a place to stay and take a shower and darkness was going to set in soon. The first place was an Elks lodge that was open to the public, but only offered parking & I wanted power and a shower. 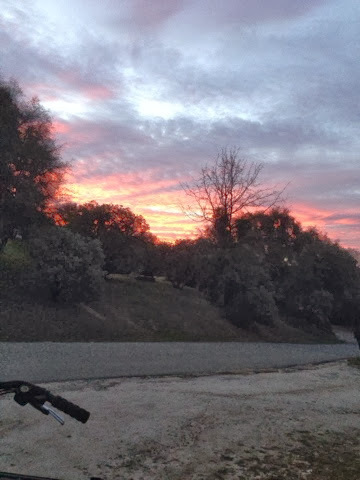 I moved on to the first main town of Oakhurst and there was a campground and I had time to check in and then treat myself to one of many restaurants within a quarter mile. I arrived after 5p so the reception was closed and it became self park and pay. There was a sign that the showeres requires a key that you must get from them with a $20 deposit. That wouldn't work as how would I get a key, so I left. I skipped the KOA campground because of cost and went to the next campground and found our it was for club members only. Didn't see the fine print in AllStays. Err. Wasted my time there. In between this place and the KOA was a casino but it wasn't listed as park and stay friendly in AllStays and just wanting to settle in for the night and eat, now that it was close to 6p. I ended up going to the KOA campground and paid $42.75 for electricity and water. This is the highest amount I paid so far on this trip. Registration was closed here too so I read the rules and went and found a site then I needed to walk the envelope with money back at the office and drop it in the slot. Now about 6:30p I heated up leftovers just to eat something to satisfy the need for food. It's amazing what a fresh mind can do. I watched the weather this am and knew the weather front that had me leave San Francisco to get to Yosemite on Saturday for the best weather, was headed toward me. Even though the farther south I went there would be less moisture from the front I didn't want to risk having bad weather. The morning sunrise told the story - "Red sky's in the morming saylors take warning." It was time to move to good weather. My origunsl plan from the other day was to go to Sequoia National Park south of Yosemite, but a check of their web page said it all. "Must have chains to enter the park." With potential rain or snow in that area there was no compelling reason to go. So I looked where could I go in 3 to 4 hours drive and make my way towards Phoenix where I pick up niece Brisnna there next Saturday. 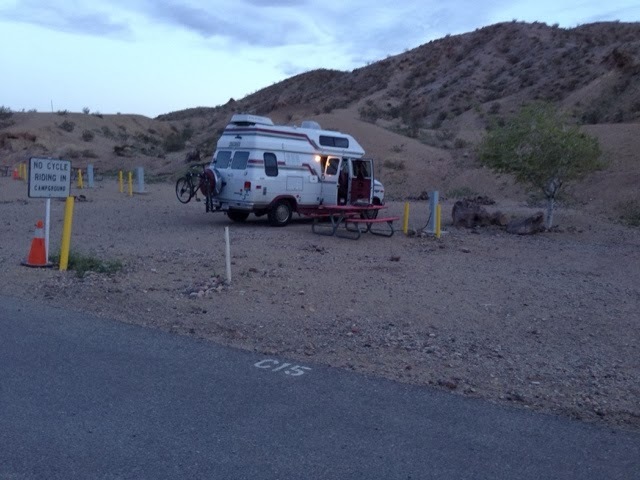 With this logic in mind I found a county park campground in Barstow, CA. 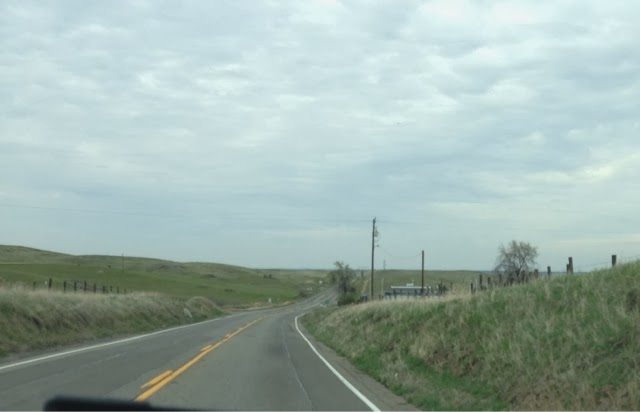 It sounded interesting as it is at a ghost town. I left the KOA towards Fresno and my morning stop at McDonalds there. It was all down hill as I stayed in the mountain foothills and Fresno is in the valley. Check out the clouds that had already come in preceding the weather front. 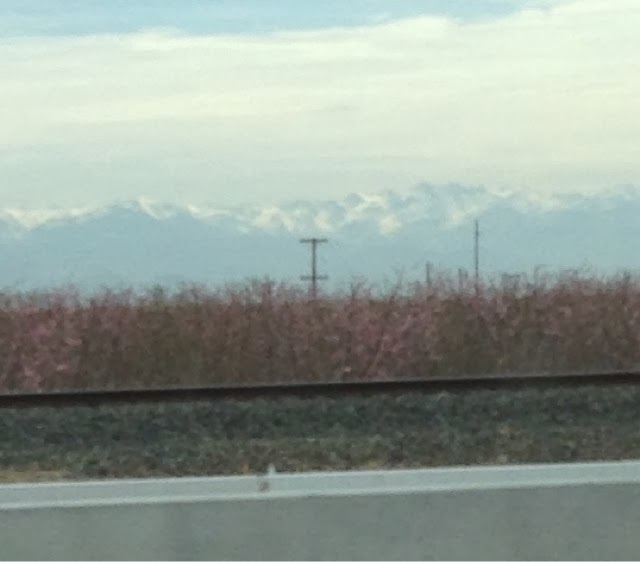 Off in the distance you can see the Sequoia National Park with the snow on the mountains. 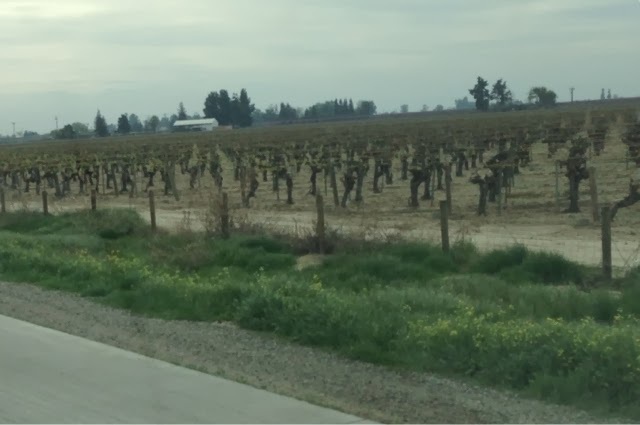 As I drove south on CA99 you can understand how important this area is to the production of vegetables, fruits and nuts for the country. Over the 100+ miles to Bakersfield you can see mile after mile of grape vines, fruit trees, and many other crops on both sides if the highway going out miles to the left and right. 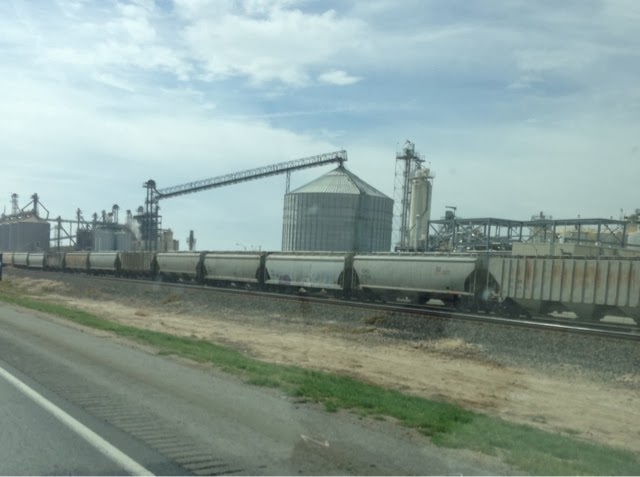 The rail road parallels the road and along it farm industry. Along the way there were signs "No Water = No Jobs" the whoe way to Bakersfield. 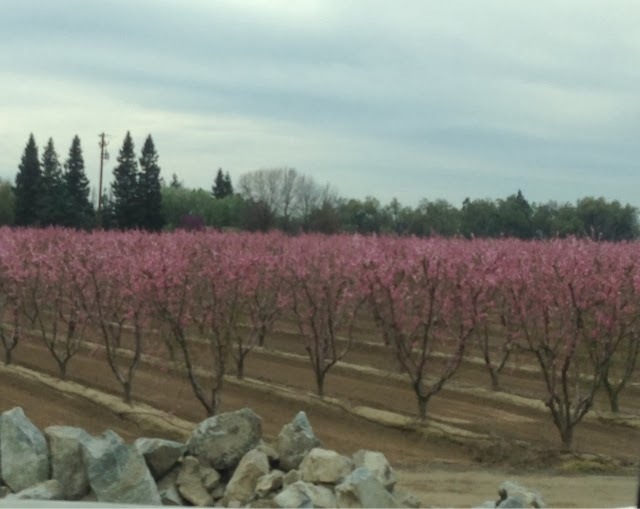 The drought in California has an impact on all of us even if the crops we get are not from here. We have a US economy and what affects one affects us all. I hope it rains and workers keep their jobs and that means that food prices stay as little changed as possible, and that those service industries that make their lives off of workers and businesses spending will also keep their jobs too. 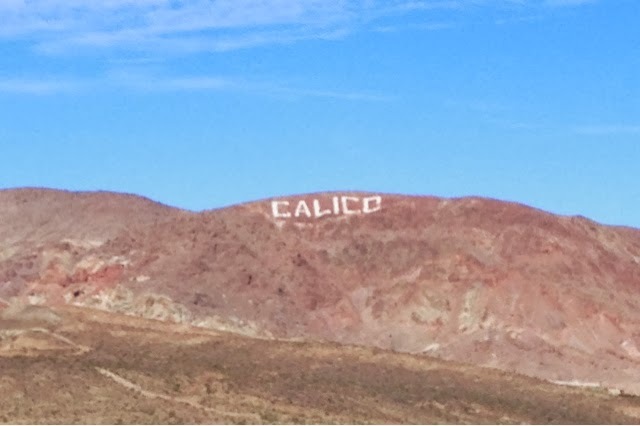 It appears that CA doesn't do a good job of managing the water they have and they don't have a way of retaining the water that comes from rain. Even though fixing these problems would help, they need rain. Just think of the miles of crop land between Fresno and Bakersfield that must get water. This can't happen without rain. I took a left in Bakersfield to head to Batstow. I climbed hills to get to 5000 ft elevation to get to the high desert. 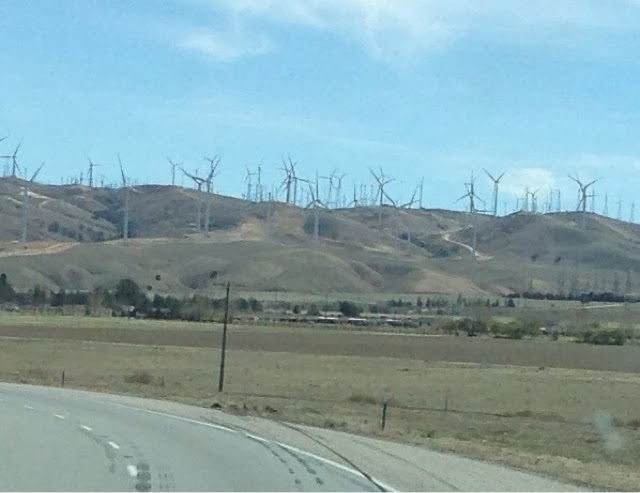 At the top of the climb are hundreds of windmills. Checkout the blue skys as I leave the weather front behind. I drove by 20 Mule Team Road and came upon where Borax is made just outside Barstow. 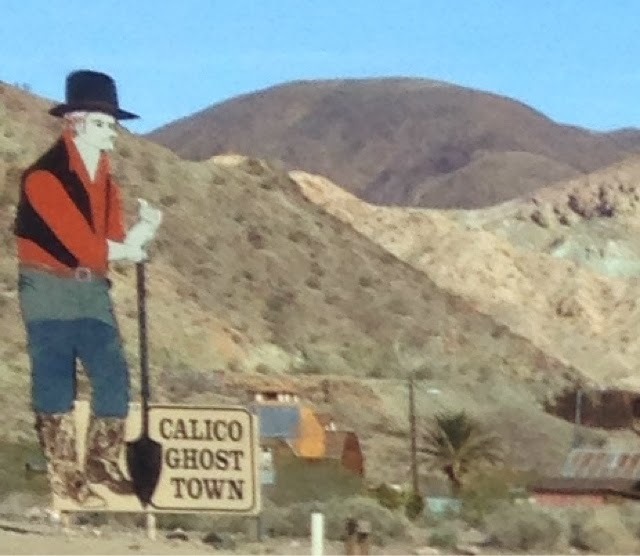 Just on the other side of Barstow off I15 to Las Vegas is Calico Mine that was the largest silver mine at its heyday. There used to be 5000 people lived here. The County now owns the location and the campground is in the same location as the silver mine attraction. 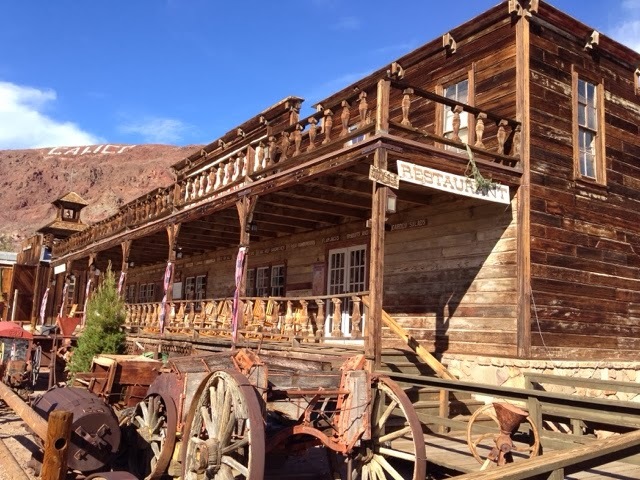 When you stay at the campground you get into the silver mine ghost town. 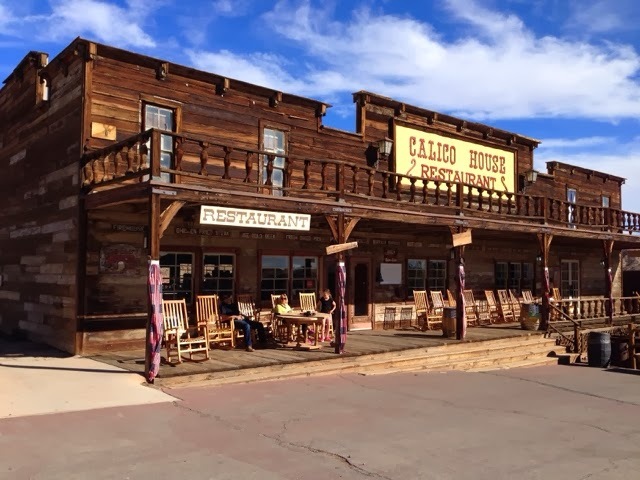 It is now an attraction and there are many shops and restaurants and a tour of the mine and a narrow gage railroad. This picture doesn't look like a campground. 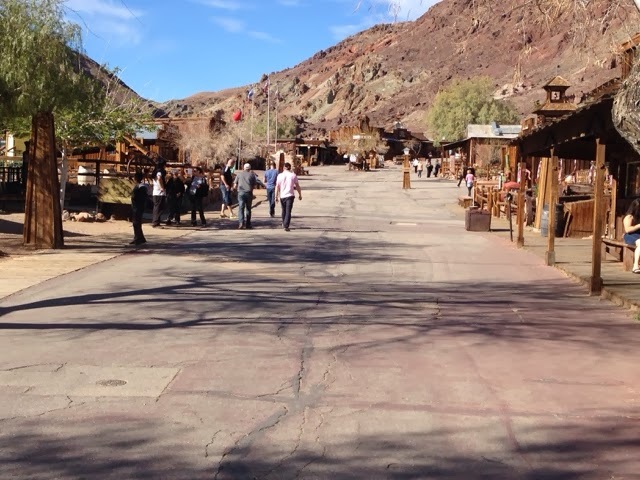 This is Main Street at the Ghost Town. Only one building is original (not this one) and the rest are rebuilt. 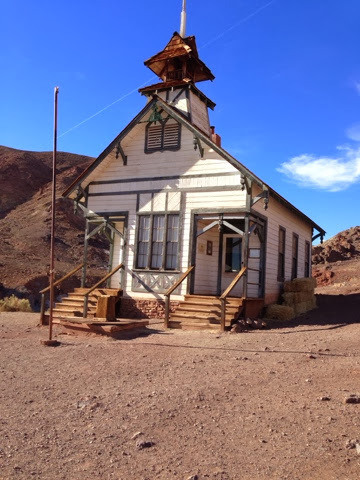 The school is a replica that was rebuilt in 1955. In the campground there are different areas. I chose just electricity as there is a common water source one sit over. The bathrooms are combination bathroom/shower and they are 2 sites over. 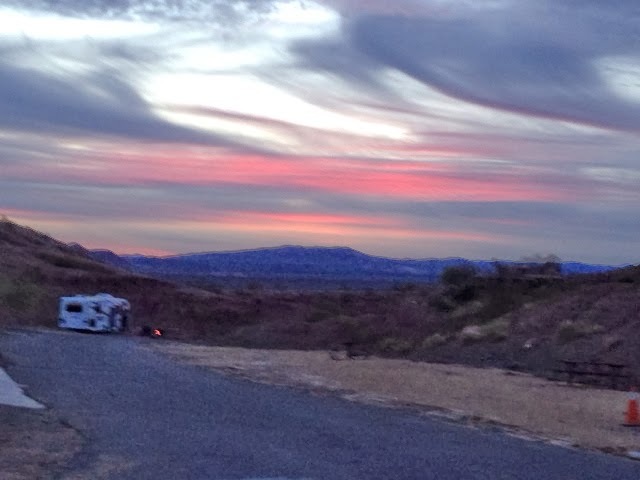 This is my sunset today from campsite. Yes this is better "Red skys at night saylors delight." Tomorrow another step towards Phoenix.